Anhydrous ammonia is a key ingredient in the illegal production of methamphetamines (meth). Anhydrous ammonia can be used illicitly for the production of the highly addictive drug methamphetamine (meth), a powerful central nervous system stimulant. One method to produce meth requires ammonia which is stolen from agricultural chemical dealerships and farms. The following list of links, followed by a brief description, is for the first responder, fertilizer ammonia dealer and the producer. Methamphetamine and Meth Labs. The Meth Lab Program at the Minnesota Department of Health, in conjunction with many public and private organizations, has been working to share resources, raise awareness, protect endangered children, provide training and equipment for first responders and other at-risk staff, and to help Minnesota communities work together to create a strong local response to this problem through education, training, and civil action. EPA Chemical Safety Alert - Anhydrous Ammonia Theft (PDF). This Alert discusses the potential hazards of anhydrous ammonia releases caused by theft, steps facilities can take to prevent theft and how to minimize health and safety risks associated with accidental releases. This Alert should be read by individuals who operate and maintain agricultural retail operations, facilities with ammonia refrigeration systems and farmers who apply anhydrous ammonia as a fertilizer. Furthermore, this Alert should be reviewed by law enforcement personnel, emergency responders and members of Local Emergency Planning Committees (LEPCs). EPA Chemical Emergency Preparedness and Prevention Advisory, Ammonia (PDF). This advisory recommends ways Local Emergency Planning Committees (LEPCs) and chemical facilities can minimize risks posed by the presence of ammonia in their communities EPA stresses that although mishandling of ammonia can cause harm, there is no cause for undue alarm about its presence in the community. Koch Crime Institute. The Anti-Meth Site. A library packed with links to clandestine lab cleanup; enforcement issues; meth facts; warning signs of a lab in your neighborhood; meth abuse; newspaper articles; etc. Ammonia Cylinder Mitigation (DOC). Anhydrous ammonia is a particular problem in addressing clandestine drug labs due to its widespread use in the manufacture of illegal methamphetamine. Ammonia is generally stolen from agricultural sources and frequently transferred into twenty-pound propane cylinders. Anhydrous ammonia can also be stored as a super-cooled liquid in insulated thermos-type containers. 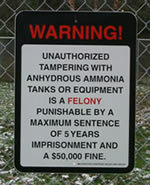 Anhydrous Ammonia Theft (Iowa State University Extension). Practical steps any farmer or fertilizer dealer can do to protect their supplies of ammonia. Farmers' Responsibilities in the War against Methamphetamine. Farmers have many partners in the fight against methamphetamine. These partners include law enforcement, health professionals, educators, local and state officials, and others with a vested interest. However, the farmer's role and responsibility is an important key. A University of Minnesota Engineering Note. Hazards of Ammonia When Used for the Illegal Production of Methamphetamine (PDF). Fact sheet from the Minnesota Department of Agriculture.